In South Texas, Fair Wages Elude Farmworkers, 50 Years After Historic Strike Farmworkers in South Texas marched 200 miles for better wages and working conditions. But the strike ultimately failed, and workers today face the same problem: growers who systematically underpay. Justino DeLeon, 58, stands in front of his home in Pharr, Texas. A former watermelon picker; he retired from farm work when he fell off a melon truck and hurt his arm. If you watch a watermelon harvest you may never think about the pink summery fruit again the same way. Two pickers walk the rows. They bend over and grab the 20-pound gourds and pitch them to a man perched on the side of a dump truck, who heaves them up to another catcher in the truck bed. The pickers have arms like Popeye and the timing of acrobats. They like this crop because the bigger the melons the more they can earn. I've seen that watermelon has no friends. They're sweet to eat, but hell to harvest. These days, field hands in the Rio Grande Valley are supposed to earn at least the minimum wage of $7.25 an hour. They have port-a-potties and fresh water in the fields, and crop dusters no longer spray pesticide on them. A lot has changed since 1966, when watermelon workers in the South Texas borderlands walked out of the melon fields in a historic strike to protest poor wages and appalling working conditions. They marched 400 miles to the state capital of Austin; California labor activist and union leader Cesar Chavez joined them. 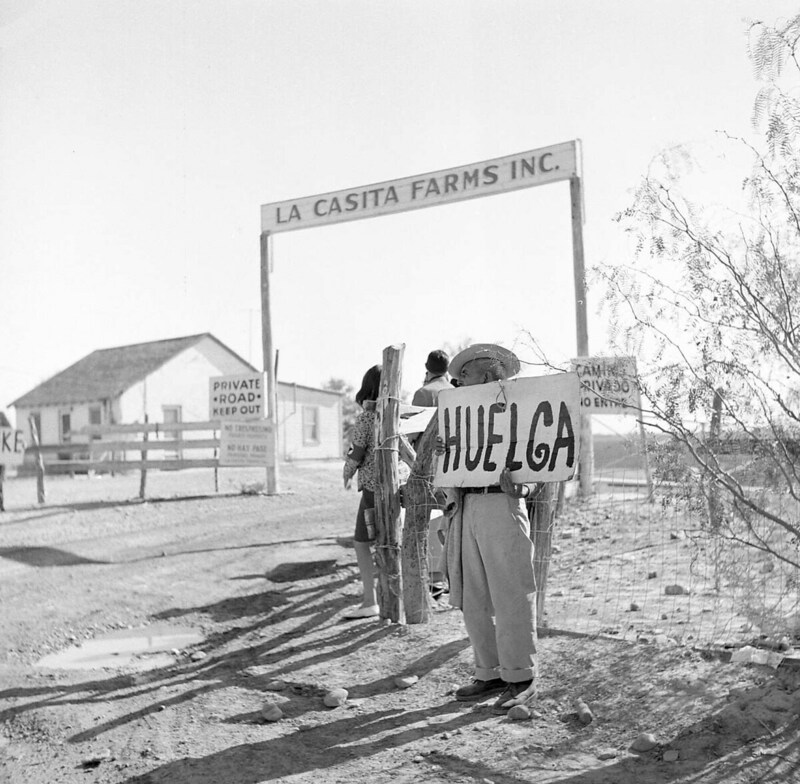 The farmworkers succeeded in publicizing their cause — but ultimately, the strike failed when replacement workers were brought in. 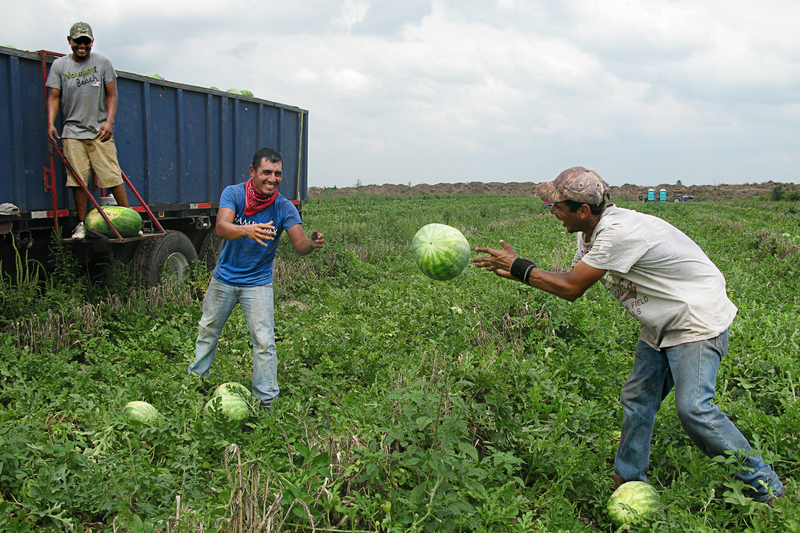 Workers harvest watermelons in Texas's Rio Grande Valley. Still, working conditions have improved in the decades since the failed strike. What hasn't changed is the work: It's as brutal as ever. 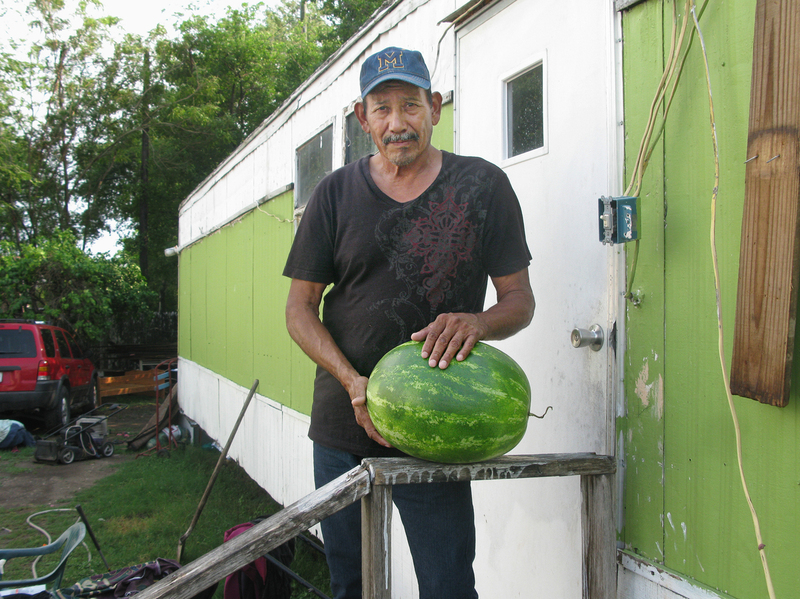 "I've seen that watermelon has no friends," says Justino DeLeon, a 58-year-old retired farmworker. He fell off a melon truck and hurt his arm three years ago. He lives in a battered green mobile home in the town of Pharr. "They're sweet to eat, but hell to harvest." "You have to be in great condition to toss melons all day," DeLeon continues. "You work hard in the heat and it's easy to get dehydrated." The strike of melon field workers in South Texas' Starr County began in the summer of 1966 and lasted for about 90 days. It was the first movement by the National Farm Workers' Association (later the United Farm Workers) in Texas. It's not just that field work is grueling. Workers are vulnerable to getting cheated by growers and crew bosses. Since 2010, the McAllen, Texas, district office of the U.S. Department of Labor's Wage and Hour Division has filed more than 650 cases against growers and farm labor contractors affecting nearly 2,500 workers. Other cases have been pursued by the farmworkers themselves. Six jalapeno pickers sued a grower named Bauer Farms for not paying minimum wage during the 2010-2011 harvest. "Our pay was very low," says plaintiff Francisco Javier Alvarez. "One day we only made $30 even though the four of us worked late into the night." He says out of about 100 workers who received low wages, few were willing to step forward and join the lawsuit. "Some were undocumented but some had legal status and they still would not speak up," he says. "It's almost as if they had grown accustomed to that type of treatment from Bauer." In addition to not receiving minimum wage, workers had to buy knives and work gloves from the contractor, which further reduced their pay. The Bauer Farms lawsuit was settled out of court two years ago. The owner, Ed Bauer, reached by phone, declined to discuss the case. "It's always been a problem that farmworkers are not paid certainly a just wage and are not even paid the minimum wage," says Daniela Dwyer, a lawyer at Texas Rio Grande Legal Aid, which handled the Bauer lawsuit. "But it's a problem that's becoming ever more severe because the federal minimum wage has been stagnant for a very long time." Texas — with the third-largest population of farmworkers after California and Florida — has some of the lowest agricultural wages in the country. It stands in contrast to California, where the presence of the United Farm Workers union has raised salaries for field hands. "Oftentimes when we national farmworker advocates get together we joke about California being the land of Narnia," Dwyer says. Agribusiness in general is suffering from a labor shortage. In some farms on the West Coast, growers are offering bonuses and better housing to attract pickers. Some farmers complain that increased border security is stopping more unauthorized immigrants, who pick most of America's produce. Then there's the nature of the work. "It's a very difficult job," says Frank Schuster, a 63-year-old grower whose father came from Austria to farm this fertile delta along the winding Rio Grande. "There are other options for labor besides the back-breaking labor of farmwork (like) flipping burgers." Frank Schuster, squatting in a parsley field, is a lifelong grower in the Rio Grande Valley and owns Val Verde Vegetable Co. Growers have heard the criticism: If you want to solve the labor shortage, pay your workers better. But Schuster, who hires about 200 farmworkers a year, says it's not that simple. 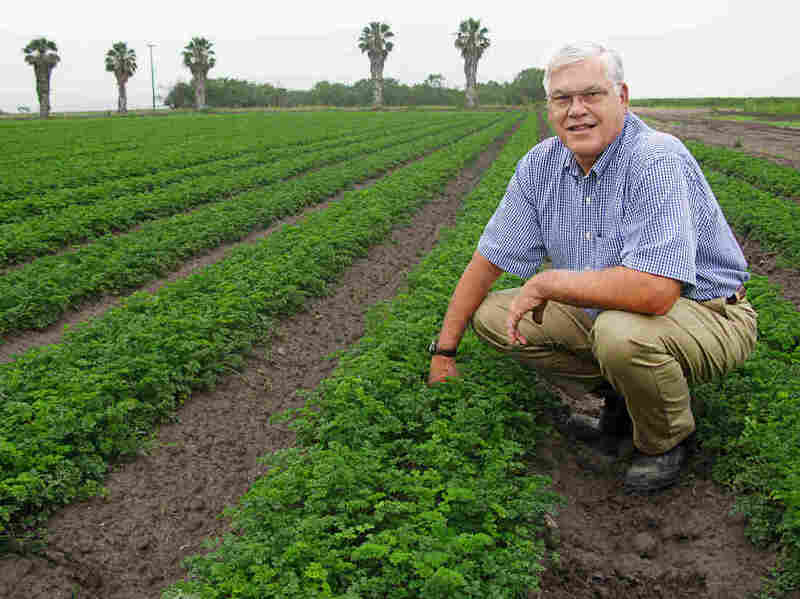 Agriculture in the Rio Grande Valley is at the mercy of market forces and geography. "We have to put our product to the consumer at a price as cheap as other areas can do it. We have to compete with people who have a cheaper freight rate into the markets than what we do," Schuster says. "Georgia is a whole lot closer to the northeast (markets) than South Texas." Many farmworkers interviewed for this report believe another reason for depressed wages in South Texas is the heavy presence of unauthorized field hands from Mexico. Of the estimated 2.5 million laborers working on U.S. farms and ranches, 50 to 70 percent are thought to be in the country illegally, according to the national advocacy group Farmworker Justice. And Texas is unique. With its long international border and network of federal checkpoints on outbound highways, these immigrants are effectively trapped in the tip of Texas. "The majority are undocumented," says Andres Jimenez, a former farmworker, born in Mexico, who came to the U.S. illegally. "I think labor contractors choose them (undocumented workers) because they'll work for less. A legal American does not want to work 12 hours under the sun, picking onions and pitching watermelons." As soon as Jimenez got a work permit, he quit the fields. Now he's a manager at a Dollar Store in the town of Elsa. This is where history repeats itself. In 1966, growers in cahoots with the Texas Rangers brought in pickers from Mexico to break the farmworker strike. Mexicans harvested the melons and put picketing Texas workers out of a job. Today, Mexican laborers pick much of America's produce. But 50 years later, they're not necessarily replacing legal U.S. workers. The fact is, fewer and fewer U.S. residents or citizens are willing to do this work. Arnulfo and Aurora Gonzalez live in a tidy mobile home across the road from a field of spiky aloe vera plants. Aurora retired last year at age 80 after spending 60 years in the fields first as a picker, then as a labor contractor. Her bronze, furrowed face attests to a life outside. 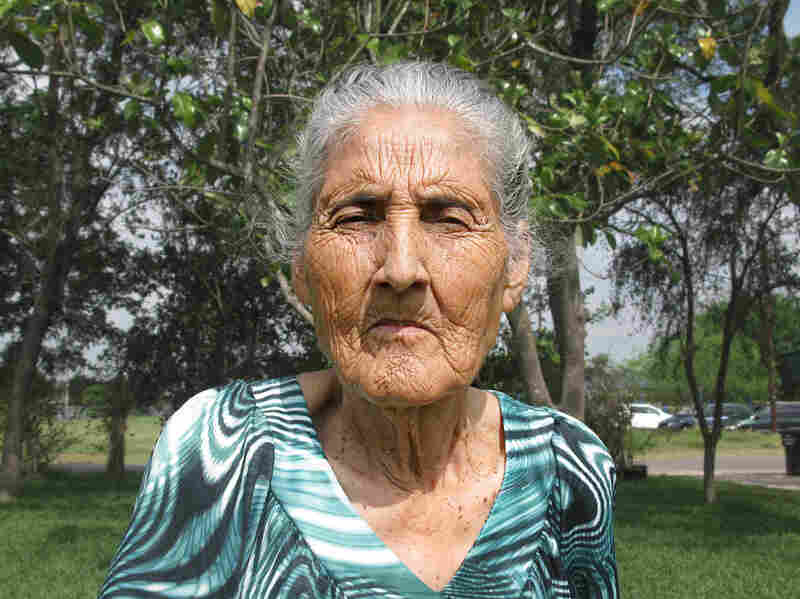 Aurora Gonzalez, 81, retired last year after working in fields for 60 years as a farm labor contractor. Though she was not part of the '66 strike, Aurora well remembers the conditions back then. "We worked from sunup to sundown and we earned almost nothing," she says. "When you had to relieve yourself, you just went out in the open. Now everybody earns more. They get an education. Now they have everything. And before, no!" She exaggerates the current status of farmworkers. Today, young people who have other options shun field work. Her fresh-faced grandson, Aaron Gonzalez, who is 19, sits on the sofa next to her. As a kid, he worked in the fields with his family, but he vowed last summer would be his last watermelon harvest. Aaron is going to St. Edwards University in Austin to be an athletic trainer. "I did not enjoy it," he says. "I'd rather be in air conditioning and in college than be working from 5 in the morning all the way to 3 in the afternoon, in the sun all day picking watermelons. I'd rather do something else than work in the fields."